Welcome to the thrill of singing when four or forty men blend their voices in the unique barbershop harmony style a cappella singing. 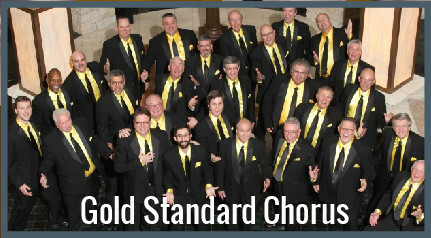 The Gold Standard Chorus is the performing unit of the Charlotte Chapter of the Barbershop Harmony Society. The Charlotte Chapter was formed in 1950 and has been going strong ever since. Barbershoppers get their fun in singing — for each other and for the public. The more we sing, the more we enjoy it, whether we’re singing a screamer tag or a tender love song. We are part of the Carolinas District of the Barbershop Harmony Society. In additional to annual conventions, we also perform regularly in the Charlotte metro area. Since choral singing is a team sport, we do have auditions, but anyone with a desire to sing and improve is welcome. The ability to sight-read is not required. If you have any questions about the chorus or the barbershop style of a cappella singing, call our Steve at (704) 560-8639. As the name suggests, the Society’s purpose is to perpetuate and spread this uniquely American musical art form throughout the world. There are more than 32,000 members in more than 825 chapters in the United States and Canada. Affiliated organizations throughout the world include Australia, Germany, Ireland, New Zealand, South Africa, Sweden, The Netherlands, and Great Britain. There are also barbershop singers in Denmark, Japan, Saudi Arabia, Uganda, China, Hungary, Spain, Brazil, Argentina, Iceland, and the Russian Federation.. This style of unaccompanied vocal music is characterized by consonant four-part chords for every melody note. The voice parts are tenor, lead, baritone and bass. The lead usually sings the melody, the tenor harmonizing above, the bass singing the lowest harmonizing notes and the baritone completing the chord either above or below the lead.